Sergio Mattarella, OMRI, OMCA (Italian pronunciation: [ˈsɛrdʒo mattaˈrɛlla]; born 23 July 1941) is an Italian politician, lawyer and judge who is the 12th and current President of Italy since 2015. He was a member of Parliament from 1983 to 2008, serving as Minister of Education from 1989 to 1990 and as Minister of Defence from 1999 to 2001. In 2011, he became an elected judge on the Constitutional Court. On 31 January 2015, he was elected by parliament to be the 12th President of the Italian Republic. He is the first Sicilian to have held the post. Mattarella entered politics after the assassination of his brother Piersanti by the Mafia. His parliamentary career began in 1983, when he was elected a member of the Chamber of Deputies in left-leaning faction of the DC that had supported an agreement with the Italian Communist Party (PCI) led by Enrico Berlinguer, the so-called Historic Compromise. The following year he was entrusted by the Secretary of the Christian Democrat, Ciriaco De Mita, to "clean up" the Sicilian faction of the party from Mafia control, at a time when made men of Cosa Nostra like Salvo Lima and Vito Ciancimino were powerful political figures. In 1985 Mattarella helped the young lawyer Leoluca Orlando, who had worked alongside his brother Piersanti during his governorship of Sicily, to become the new Mayor of Palermo. 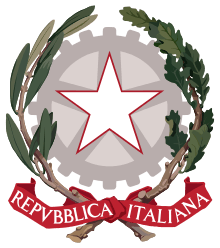 Mattarella was one of the first supporters of the economist Romano Prodi at the head of the centre-left coalition known as The Olive Tree (L'Ulivo) in the 1996 general election. After the electoral victory of the centre-left, Mattarella served as President of the PPI's parliamentary group. Two years later, when Prodi's first government fell, Mattarella was appointed Deputy Prime Minister and Minister of Defence in the government of Massimo D'Alema, then-leader of the Democrats of the Left (DS) . As Defence Minister he supported the NATO Intervention in Yugoslavia against the Serbian President Slobodan Milošević; he also approved a reform of the Italian Armed Forces which abolished conscription. After the resignation of D'Alema in 2000, Mattarella kept his position as Minister of Defence in the government of Giuliano Amato. Mattarella with the U.S. Secretary of Defense William Cohen in March 2000. Mattarella was officially endorsed by the Democratic Party, after his name was put forward by the Prime Minister Matteo Renzi. 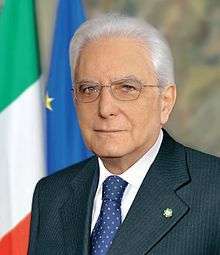 Mattarella replaced Giorgio Napolitano, who had served for nine years, the longest presidency in the history of the Italian Republic. His first statement as new President was: "My thoughts go first and especially to the difficulties and hopes of our fellow citizens". On 6 May 2015 President Mattarella signed the new Italian electoral law, known as Italicum, which provides for a two-round system based on party-list proportional representation, corrected by a majority bonus and a 3% election threshold. Candidates run for election in 100 multi-member constituencies with open lists, except for a single candidate chosen by each party who is the first to be elected. He was married to Marisa Chiazzese, daughter of Lauro Chiazzese, a professor of Roman law and rector of the University of Palermo. His wife died in 2012. He has three children. 1 2 3 "Sergio Mattarella chi è?". Il Post (in Italian). 29 January 2015. Retrieved 31 January 2015. ↑ Gigante Lorenzo. "Personaggi Trapanesi - Bernardo Mattarella". trapaninostra.it. ↑ Messina, Sebastiano (29 January 2015). "Sergio Mattarella: dalla morte di Piersanti al no sulla Mammì, una carriera con la schiena dritta". Repubblica.it. 1 2 3 4 5 Cedrone, Giovanni (30 January 2015). "Sergio Mattarella, 35 anni di politica all'insegna della riservatezza". 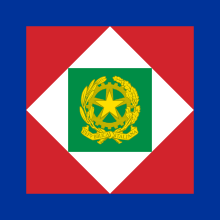 La Repubblica (in Italian). Retrieved 31 January 2015. ↑ "È il Mattarellum il piano B del governo - Corriere.it". Corriere della Sera. ↑ Credazzi, Guido (2 August 1994). "Mancino: non saro' capogruppo, e Mattarella lascia il 'Popolo'". Corriere della Sera (in Italian). Retrieved 2 February 2015. ↑ "The Constitutional Court: Composition of the Court". Constitutional Court of Italy. Retrieved 30 January 2015. ↑ "Mattarella: "Il pensiero va alle difficoltà e alle speranze dei nostri concittadini"". Video Corriere. ↑ "Italy MPs elect judge Sergio Mattarella as president". BBC News. 1 February 2015. Retrieved 2 February 2015. ↑ "Italy Elects President, While Mulling a Change in Role". New York Times. 1 February 2015. Retrieved 2 February 2015. ↑ Saviano, Carmine (31 January 2015). "Mattarella, davanti alla tv con i figli. Poi in Panda e, a sorpresa, va alle Fosse Ardeatine". Repubblica.it. ↑ "Sergio Mattarella: profilo privato di un uomo misurato" (in Italian). Panorama. January 30, 2015. Retrieved January 31, 2015.